A super comfortable dress is a closet must-have. This Betsy Johnson blue and black floral sheath is incredibly soft, moves with you (no cling!) and doesn't wrinkle. Best of all, it can be worn almost all year round. I found similar styles for you which I love. They're all $100 or less AND have sleeves---now that's a concept! I paired the dress with a structured black leather bag and suede booties. Did you know you can wear your booties right into spring? A cape or poncho is such a chic piece to throw on for added warmth and coverage. Here is a similar piece for just $9.99! As you can see, I'm not wearing much jewelry. I like a print to stand out on it's own. 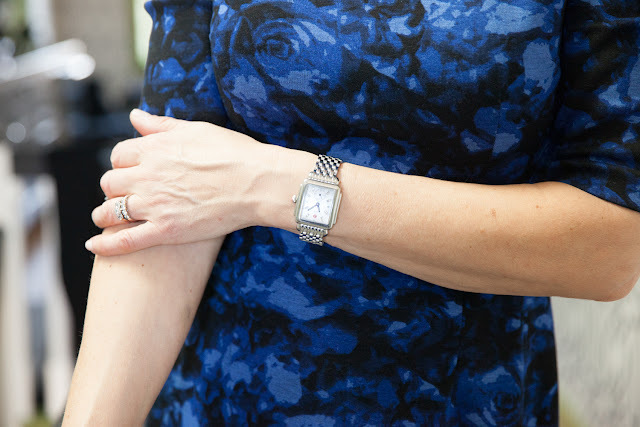 However, I am wearing one of my most treasured pieces, a Michele watch that Richard gave me for our 10th wedding anniversary. Keep it simple, keep it real...this has become my style motto as I get older. Less is more. I like this dress! It would look nice with flats as well! Thanks Pam and totally agree! Stunning! You and the dress! The booties give it such an on point vibe. Bravo!